Super crispy waffle cut fries covered in Monterey Jack Cheddar and Pepper Jack cheeses, topped with real bacon bits served with spicy ranch for dipping. Sweet rings breaded and fried to a golden brown. Add your choice of our Housemade Dressings for $0.85. Served Mild or Hot on the side, choice of dressing and celery. Served Mild or Hot with celery and choice of dressing. Crisp green beans breaded with a perfectly spicy breading and fried to golden perfection. A jumbo sandwich with your choice of Smoked Beef, Pork or Turkey served piping hot on garlic toast with french fries and cole slaw or baked beans. All great sandwiches are served with French fries, unless otherwise indicated. Smoked on site, pulled and mixed with our Rib City tangy sauce and unique spices served on a bun with two sides. A fresh, hand-patted 8 oz. burger, grilled to your order. A fresh chicken breast brushed with our sweet sauce and grilled, served with lettuce, tomato and onion. A belly busting 1/4 lb. all beef hot dog. Make it a Sloppy Dog for $1.00 more. Lightly breaded, tossed in Mild or Hot Buffalo sauce, topped with Pepper Jack, lettuce, tomato and Spicy Ranch on the side. Hand breaded and fried to a golden brown served on a bun with lettuce, tomato, onion and tartar sauce. Slow smoked to perfection beef brisket served on a bun with a drizzle of our signature sweet sauce. 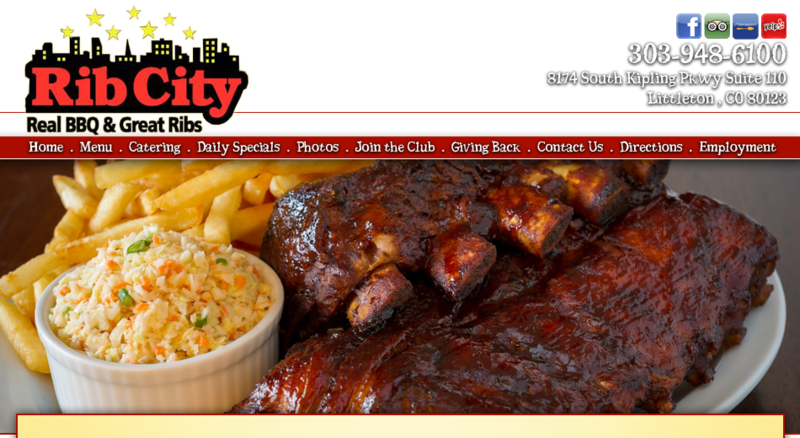 "Our Promise to You: If you have to pick up a knife to eat our Baby Back Ribs, we will pick up your meal!" Quite simply the best you've ever had! All white meat add $1.00. Tender rib tips grilled & basted with our sweet BBQ sauce. If you like traditional Spare Ribs, you'll love these closely trimmed ribs. Something you can sink your teeth into. Slowly cooked over Red Oak, sliced thin and piled high. Smoked on site pulled pork mixed with our Rib City tangy sauce and unique spices. Boneless breast of turkey sliced thin, moist and tender. Smoked sausage basted in sweet sauce and grilled to perfection. Slow smoked to perfection beef brisket with a drizzle of our signature sweet sauce on top. Substitute in place of a regular side item for $2.49. Substitute in place of a regular side item for $1.29. Create Your Own Bar-B-Q Combination! Full rack of Baby Back Ribs and choice of one: 1/4 Chicken, 1/4 lb. Sliced Pork, Sliced Beef, or Pulled Pork. Delicious shrimp lightly breaded and fried to perfection! 1/2 Rack of Baby Back Ribs and lightly breaded shrimp. Baby back ribs, smoked pork, beef and chicken, two potatoes, two cole slaw, two beans and two garlic toast. French fries, garlic bread and your choice of cole slaw or baked beans. Your choice of our tender smoked, sliced pork or our Rib City pulled pork. 1/4 chicken blasted in our sweet barbeque sauce. You'll love this Rib City favorite sliced thin. 1/4 chicken and sliced beef, sliced pork or pulled pork - your choice. Two 1/4 lb. all beef hot dogs smothered in our BBQ Beans. Housemade Dressings: Bleu Cheese, Ranch, Honey Mustard, Thousand Island, Balsamic, Oil & Vinegar, Spicy Ranch or Light Italian. Our fresh garden salad with tender turkey. Our fresh garden salad with wood smoked beef eye round. Our fresh garden salad with a grilled, sliced chicken breast. 1/4 chicken and a fresh garden salad. Our fresh garden salad with crunchy fried shrimp. Our fresh garden salad with sliced, smoked turkey breast, our shredded three cheese blend and real bacon bits. A la carte with choice of dressing. Sweet, Tangy, Hot or Carolina Mustard. Your Kids Meal (one piece of chicken & fries) is on us! Dine In Only. French Fries, Applesauce, Corn Cobbette or Mandarin Oranges.